Other than doing my bee blocks, I have been quite unmotivated to finish up projects from last year. So, I decided to join up with the FAL being hosted by Leanne this year! Two things need to get done this quarter. I need to add borders, probably pin the voile backing (ugh)-wish I could spray baste! These are all cut, and have been on my design wall in different combinations for over a month while I decide what to do with them! They are taking up too much space, and I want my design wall back! Linking up with Leanne, and I hope I get these done! Those are a couple of beautiful unfinished projects, I am looking forward to seeing how they turn ou! You are so nearly there on the Starry, Starry night Patti you will fly through it once you start! Good luck on finishing them. Both projects are super cute. Both of these look great! I canot wait to see them after their quilted and bound! It is frustrating when we get to a certain point with a quilt and don't want to keep going. Joining the FAL is a great idea. 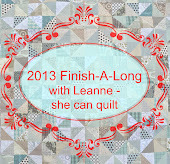 I think both quilts are lovely and I am looking forward to seeing them come together! I really love starry night and the triangles are made from the best fabric, I wonder what you will finally do with them. I will be watching to see, I am glad you will be finishing along. I sometimes find I fall out if love with quilts and they need to go away to "mature" until I love. Them enough to finish them, there two look lovely ( I've always loved your starry night). Have fun finishing them! From the inside lookin' out!